I love baseball statistics in so far as they are able to separate me from reality. This renders me useless both to baseball analysts and to people who have no need for baseball statistics whatsoever. I dissolve into baseball statistics, hide in them. Sometimes I emerge with half-baked notions and outright distortions. More often I return to my life with nothing at all, the numbers I vanished into themselves vanishing from my mind like the sugary flavor of the gum that used to come with these cards. It’s been this way for more than three decades, since even before this 1976 Jim Wynn card came into my 8-year-old hands. That said, I would like to disappear into some numbers for a while so as to explore the notion that Jim Wynn was, as he appears here to be, so very, very tired in 1976. I like to think of Wynn wearing this expression throughout the 1976 season. I also try to imagine that he wore the cap pictured here. I know that this is impossible, since this headgear is most likely a Los Angeles Dodger cap subjected to another rushed doctoring job performed by the Topps art department (for more on this process and its existential ramifications, see Dave Cash), yet I still prefer to think of Jim Wynn wearing a cap that looks as if it has been decorated by first graders just learning to write cursive lowercase letters and color between the lines. 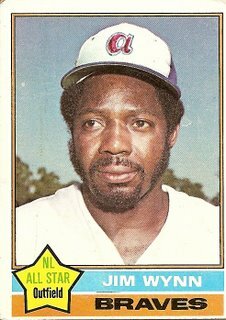 Thusly attired, Jim Wynn authored a season that somehow perfectly expresses the utter exhaustion of a still-talented baseball slugger. His batting average was a mere .207, but in his 148 games played he managed to hit 17 home runs and also amassed a league-leading 127 walks, not that far from a walk a game. Wynn had always had a preternatural knack for drawing the walk (in fact he may have been the greatest right-handed walk-obtainer ever, not quite at the level of lefties Babe Ruth, Ted Williams, and Barry Bonds but as good or perhaps even slightly better than righties Frank Thomas, Rickey Henderson, and the Three Walkin’ Eddies: Yost, Joost, and Stanky), but though he had often approached his 1976 rate of obtaining them, he had only surpassed it once before, in 1969, and in that year he had hit for a much higher batting average than in 1976 while also pounding out nearly twice as many home runs. In other words, in 1969 opposing pitchers had much more reason to pitch carefully to Jim Wynn, which makes his comparable 1976 walk numbers even more astounding. Even though he seemed no longer able or willing to consistently make contact with the ball, he still drew the free pass. Including his walks, he had 576 trips to the batter’s box in 1976. As noted previously, he enabled himself, through his great eye and perhaps through sheer force of will, to exit the batter’s box at a relaxed saunter by obtaining a base on balls on 127 occasions. He also followed 111 other at-bats with an even shorter stroll back to the dugout after striking out. Add the 17 short jogs around the bases resulting from his 17 home runs, and you are left with precious few moments when Jim Wynn had to exert himself while his team was on offense. He only had 76 non-homer basehits, about 13 percent of his total plate appearances. There have surely been other guys with a similarly small ratio of non-homer basehits to plate appearance, but I bet none of those other guys led their teams in on-base percentage, home runs, and RBIs, as Jim Wynn did in 1976. Jim Wynn may have been tired (perhaps worn out from years of trying to muscle home runs out of the Astrodome and Dodger Stadium, his previous home ballparks, which so favored the pitcher that they may have cost Jim Wynn a spot in the Hall of Fame), but he still found a way to help his team. In fact, I believe that Jim Wynn in 1976 produced the highest ever positive ratio of offensive production versus physical energy exerted. As a person who intends, one of these days, to do good things in life but who is also, on a much more concrete level, always on the eagle-eyed lookout for his next nap, I view Jim Wynn’s 1976 season as a beacon flickering dimly through the haze, suggesting that my limited exertions may amount to something yet. You are currently browsing the archives for the Jim Wynn category.